Cast copper, tinned with engraved decoration, possibly inlaid with a black composition. 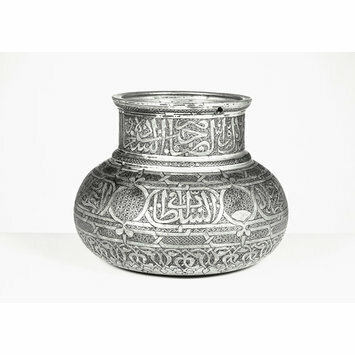 Copper wares such as this drinking jug were being made when the Safavids came to power. The tinned metal once shone like silver. It would have contrasted strongly with the recessed background, which was filled with a black composition. The inscription around the neck wishes the owner happiness, peace, and ‘a life that lasts so long as the turtle-dove coos’. The text below gives the titles of a Sultan Jalal. The jug once had a handle. 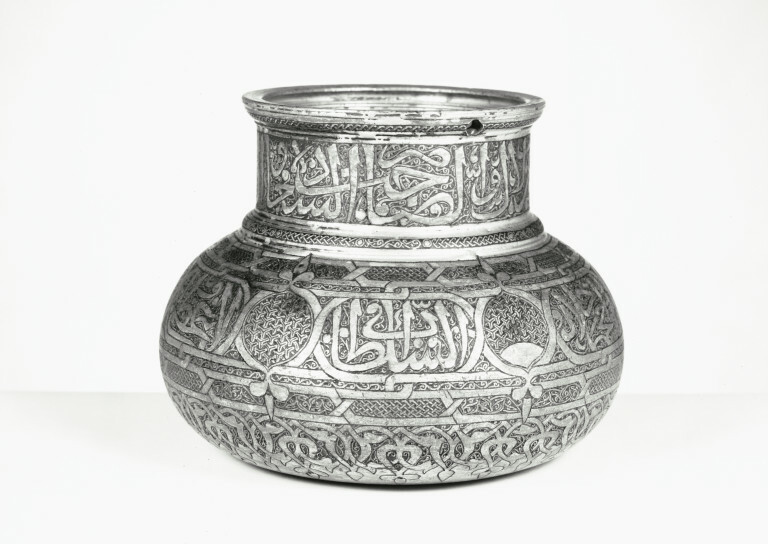 The upper inscription is from an often-quoted Arabic poem offering good wishes for the owner. "Jalal" could be the beginning of a name (e.g. Jalal al-Din) or of another title (glory of ...). Jug (mashrabe), tinned copper with engraved decoration and Arabic inscriptions, Iraq or Iran, 1475-1500. A.S. Melikian-Chirvani, Le Bronze iranien, Musée des Arts Décoratifs, Paris, 1973, pp.90-91. A. S. Melikian-Chirvani, Islamic Metalwork from the Iranian World 8-18th Centuries, London, 1982, p.255, no.113. James W. Allan, "Metalwork of the Timurid Dynasties of Eastern Anatolia and Iran", Iran, XXIX (1991), p.155, pl.XXIVa. This jug once had a bright silver and black colour scheme. The inscription around the neck wishes the owner happiness, peace, and 'a life that lasts so long as the turtle-dove coos'. The text below gives the titles of a Sultan Jalal. The jug once had a handle.